Do you need something to do on your weekends? Do you need to spend more time talking Mustangs with fellow enthusiasts? Or, do you just feel the need to see if you can add a few more trophies to your collection? Friend, you’re in luck! We’ve compiled a list of the top 10 Mustang events of 2010, so you can find a place to mingle with other Mustang owners, test your track time, or show off your ‘Stang. Number 10. 29th Annual Mustangs & All Ford Show in Grand Rapids, MI. — June 12th, hosted by the West Michigan Mustang Club. The show is open to any Ford-powered vehicle, and features awards for the top 20 Fords. Number 9. 29th Annual Chester County Car Show in Kimberton, Pa. — May 30th, hosted by the Valley Forge Mustang club in Kimberton, PA. The show will feature People’s Choice awards for the top 3 Mustangs in each class, plus a President’s Choice award. Number 8. 31st Annual Mustang & Ford Auto Show & Swap Meet in West Des Moines, IA. — June 6th, hosted by the Mustang Club of Central Iowa. Go for the Mustangs and the 38 popular vote classes, stay for the swap meet (private sales and commercial vendors) and the for-sale corral. Number 7. Mustangfest in Port Aransas, TX — October 1-3rd, this is a cruise from Mustang, OK (coolest name for a town ever) to Mustang Island, TX with a stop in San Antonio. The event is six years old, and the organizers are attempting to set a state record this year. Number 6. SVT Superfest in Alton, VA. — May 28-30th, hosted by the Southeastern Virginia Mustang club, the event is being held at Virginia International Raceway. There will be an open track for all three days, plus a banquet with guest speaker, and an SVT, Mustang, and Ford show. Number 5. 2010 MCA National at Virginia Beach, VA. — August 13-15th, also hosted by the Southeastern Virginia Mustang club, hundreds of Mustangs will be shown on Friday and Saturday, with an awards presentation on Saturday. Proceeds will benefit local and national charities. Number 4. Ford Nationals at Carlisle, PA — June 4th-6th, this event has something for everyone, with an amazing show, a vendor’s midway with some of the biggest names in aftermarket parts, and events for kids and ladies who are tired of browsing. Number 3. 2010 AmericanMuscle Car Show and Charity Event in Malvern, PA — September 11th, registration will be opening up soon and is limited to the first 500 cars, so make sure you keep an eye on the blog. Last year’s show was amazing, and this year’s is sure to be even better! Number 2. Mustang Week in Myrtle Beach, SC — July 19-25, a cruise, a massive car show, and tons of events make this one of the premier Mustang events of the year. Number 1. Mustang Club of America Grand Nationals in Bellevue, WA. — July 15-18th, mix and mingle with other Mustang fanatics while you peruse a judged show and a people’s choice show. Take a cruise through Newhalen/Gorge Dam to see some of the sights, and drink in all the gorgeous Mustangs. This is our list of awesome Mustang events. Where will you be this year? What about the Mustangs at the Mansion? The yearly car show and cruise at the Biltmore in Asheville NC. This is a huge event during Labor Day Weekend. I guess that it doesn’t take part of the top 10 🙂 just teasing you. Mustangs at the mansion? You mean the over priced under organized car show at Biltmore that is blotched a;; over the Biltmore campus without the event coordinators letting people know just where and how many areas the show is in. The same show where people have to wait for hours for buses to shuttle them into Biltmore property, the same show that Food and drinks cost as much as going to Disney world? Im pretty sure your talking about the show where all the rude security staff are giving you directions and telling you where you can and cant do, I went to that show and had to pay 100 dollars for 2 of us to walk through 3 isles of cars, that is the worst organized car show I have ever been to! Brian, I’m sorry we couldn’t include more events, we certainly didn’t want to leave any out. I hope the event went well, and that you had a great time! 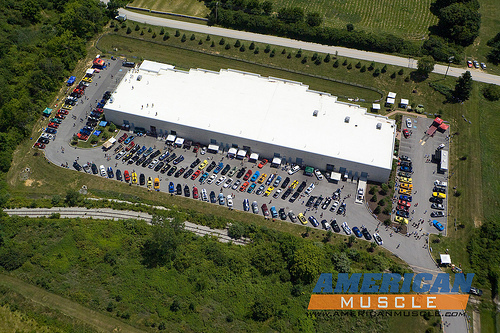 If you’re interested, you can also look for local events on our clubs page, here: http://clubs.americanmuscle.com. im not a moderator of the site but i just thought id let you know that on september 11 every year we get together at a shopping center in davie florida, all 150 mustangs from all over head down to the florida keys escorted by Florida Highway Patrol. once we get to the keys we all rent hotel room right on the beach and have a nice day with watercraft rentals, raffles, and we have a big car show with trophies. when the sun goes down we have an awesome after party, then we all spend the night and head back home the next morning. we are expecting to have the best turnout ever this September, and anyone with a stang is invited. so come along and join in on the fun! I love the Mustang. I’ve owned several over the years and only wish i could own my own collection of this classic car.